2019 | The Jamestown Comet. 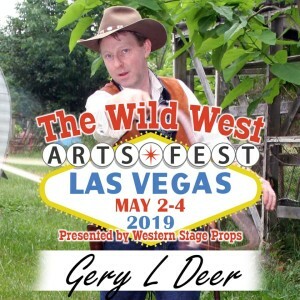 Las Vegas, Nevada, April 2, 2019 – Western Stage Props, a stage and film prop supply company based in Las Vegas, Nevada, is sponsoring the 2019 Wild West Arts Fest, May 2nd through the 4th at The Orleans Hotel and Casino in Las Vegas. The festival consists of three full days of classes focused on the four classic Western art forms of gun spinning and handling, knife throwing, trick roping and whip cracking. The festival will also include open practice time, skill sharing sessions, lighthearted competitions, nightly events including a dinner show, and more. The Western Arts are the performance skills that developed in the Old West, made famous since the earliest days of Wild West shows and cinema. While training in traditional variety arts such as juggling, dance and circus are now easier to find than ever, training in the Western Arts is limited to a select few who happen to be in the right place at the right time. This is where the organizers feel this festival is incredibly important. Now under new ownership and management, Western Stage Props in Las Vegas has provided film and stage props for nearly three decades and specializes in Western Arts products such as whips, rope, throwing weapons, prop guns and trick saddles, as well as educational material. Their products have been featured in movies and theatrical productions including Indiana Jones and the world-famous Cirque Du Soleil. They are working to develop new products designed to bring the love of the Western Arts to a broader audience. Still, they have maintained the same high-quality items that make them the leader in Western performance equipment, that’s why they chose now to resurrect a long-loved tradition – the Wild West Arts Fest. The event is open to the public as either a full participant or a spectator. Discounted room rates are also available at the hotel by mentioning the event. Complete details are available by calling Western Stage Props at 702-873-1100 or online https://www.westernstageprops.com/Wild-West-Arts-Fest-s/1920.htm. AJ Silver was born and raised in The Bronx, New York. As a child, AJ was fascinated by the cowboy tales of the Wild West. Upon seeing his first rodeo at Madison Square Garden, he found his calling: He would be a rodeo trick rider! After graduation, AJ headed for the western trail and never looked back. Since AJ has traveled across the USA performing his western variety act combining trick roping, bullwhip artistry and boleadoras. His achievements include a lifetime of stage appearances, television spots on The Today Show, Good Morning America, MTV, ESPN, CNN, and most notably, the chance to trick ride at Madison Square Garden where his riding dreams were born. David Adamovich better known as The Great Throwdini holds over 40 world records including being the world’s fastest and most accurate knife thrower. A man of many talents David ‘s previous endeavors include a career as a paramedic, appearing at the 1967 World’s Fair as a partner acrobat with his twin brother and becoming an ordained minister. David began his knife throwing adventures as The Great Throwdini in his 50’s. He has appeared on Ripley’s Believe It or Not, America’s Got Talent, and Late Night with Conan O’Brien. And just when you thought his story couldn’t get any more interesting, David is the only knife thrower to ever perform The Veiled Double Wheel of Death (2 assistants behind a paper veil), no small feat. Chris McDaniel is a long-time cowboy performing and teaching trick roping as well as delighting audiences with his whip cracking skills. Chris got his start on stage as a formally trained actor and singer, wanting to stand out in the crowd; he picked up a rope and fell in love with the Wild West. Chris has graced the stage in innumerable cabaret, variety and dinner theater stage shows across the county. His TV appearances include: Late Night with David Letterman and Best Week Ever with Neil Patrick Harris, but you may know him best from his career-defining role with the Broadway tour of The Will Roger’s Follies. Paul Nolan is one of the county’s most revered whip artisans. Paul began the art of making whips as young adolescent learning from the best in the business. He spent countless years perfecting his craft. You can see him in action on The Discovery Channel’s How It’s Made as he takes you step by step through the labor-intensive process of making one of his beautiful art pieces. Paul has been commissioned by some of Hollywood’s biggest blockbusters to make whips including The Kingsman films, The Lone Ranger, Django Unchained, and the TV series Freakshow. Loop Rawlins is a Wild West superstar. Launched to fame by his outstanding success on America’s Got Talent Loop has made an impressive career form rodeos to the red carpet. Born and raised in Tucson, Arizona, as a youngster Loop loved adventure movies and always had a knack for entertaining. When he saw trick roping for the first time, he was inspired to learn the technique. Nowadays Loop can do it all: he is a gunslinger, rope spinner and whip cracker. After a 3-year run with Cirque Du Soliel in Viva Elvis, Loop can be seen opening for country music stars, performing for celebrities and stunt doubling in the major motion picture The Kingsman. Gery Deer is a world-renowned veteran whip artist and coach and the founder of The Whip Artistry Studio in Jamestown, Ohio. Raised on a cattle farm in rural Ohio, he opened the studio in 1998 as the only permanent facility in the United States dedicated to the non-combative study of the whip for sports, fitness and performance art. The facility provides training for whip handling, targeting, competition performance, and fitness. Students of the whip studio include hobbyists, stage and stunt performers, and many performers who have worked as “Indiana Jones” in the Universal Studios’ Indiana Jones Stunt Spectacular. In addition to his work as a master whip coach, Gery has been a featured performer on stages around the country. He has appeared on countless television variety programs over his 30-year career including Steve Harvey’s Big Time, America’s Got Talent, The Bonnie Hunt Show, as well as the PBS series, Our Ohio. He also designs original whip holstering equipment and utility belts used by some of the largest production companies in the world including Universal Studios, Warner Brothers and 21st Century Fox.